Cinema Sunday: And Now The Screaming Starts! (1973) | Magazines and Monsters! Another week and another movie from Amicus Productions! Forgive me, but this one is going to be quite shorter in length than most of my reviews for two reasons. First, the original film I was going to review was taken down from a popular website that houses tons of movies, cat videos, etc. The second reason being it’s getting late, and I’m leaving for vacation tomorrow! I’ll be visiting the resting place of H.P. Lovecraft, and if all goes well, I’ll be commanding the armies of Cthulhu by mid-week, so wish me luck! This week’s film is one that I’ve never viewed before now, but heard positive things about over the years. Most Amicus films have a solid reputation, but I was slightly skeptical about the premise for this one. 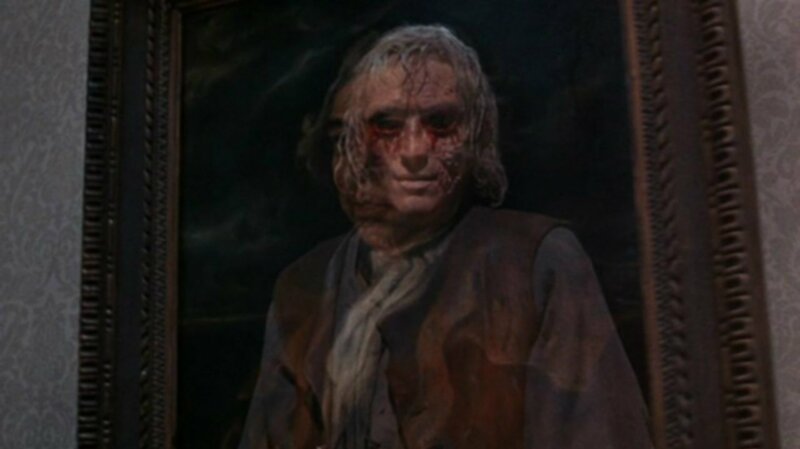 The names Peter Cushing and Herbert Lom (Hammer’s version of Phantom of the Opera, 1962) put me at ease though, and they should do that for anyone! Alright, let’s get to the movie! As the film begins, we see a couple (engaged to be married) on a carriage ride to their new home (1795). It’s the ancestral home of the groom, but his bride is about to find out it holds a dark secret! 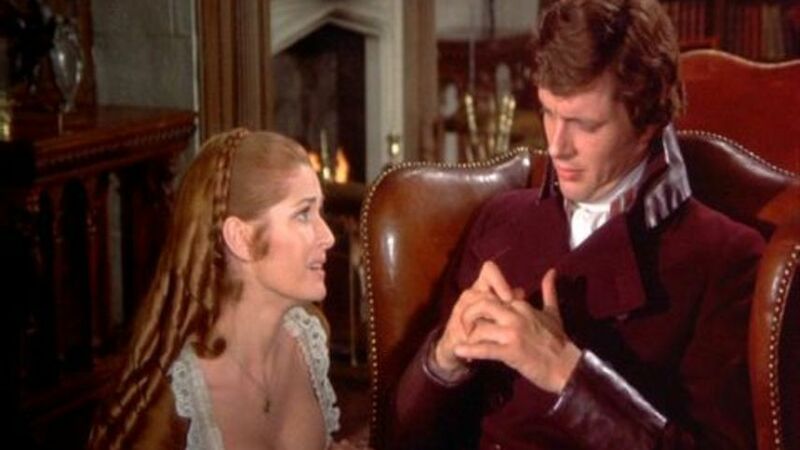 Charles (Ian Ogilvy), and Catherine (Stephanie Beacham), stroll around until they see a portrait of his grandfather (Herbert Lom). Catherine is all but hypnotized by it, and we get the impression his spirit may still dwell in the house. As she’s looking at the portrait, a hand comes bursting through it at her! As she dives away, screaming, Charles comes to her aid. Of course, the portrait is fine, and Catherine thinks she imagined the whole thing. After the wedding, the two head for the bedroom. Outside in the hallway though, is a severed hand, crawling about the house! As Charles excuses himself for a minute, Catherine closes the drapes, and is startled by a howling wolf. She dismisses it and jumps into bed, awaiting her new groom’s arrival. As she waits, the door suddenly locks by itself, and the candles go out. Catherine is then attacked by the severed hand, and perhaps someone else! Charles races downstairs and grabs an axe from the mantle, then hurries back upstairs to the locked room. He chops his way into the room, but as before, the hand is gone. A maid comes into the room, closes a window, then leaves. Charles glares at her, but says nothing to her. Later, downstairs, he tells the maid that his wife imagined the scenario. The following day, Charles tells his lawyer that he wants to leave everything to his wife in the case of his demise. That evening, Charles and Catherine are about to get busy, when she sees the face of a man with no eyes in the window. She stops for a moment, and Charles asks what’s wrong. Afterward, she goes out into the hallway and is scared stiff at the portrait that scared her earlier. The next day, Catherine heads out to the burial area, and sees a man with scars on his face, staring at her. She runs away and asks Charles who he is. He’s very vague in his response, so Catherine asks one of the servants. She’s also not in the talking mood apparently, and Catherine gets angry. Catherine then sets out to the cabin nearby, where this man lives. She confronts this woodsman (Geoffrey Whitehead), Silas, and asks to see his hands, thinking maybe it’s his hand that is crawling around the home. He shows her both of his hands, then she asks a few more questions about him and his relatives. She finds out that Charles’s family gave land to this man’s father, and that’s why he lives on the grounds of the estate. Catherine then turns to the family lawyer for answers but he’ll not give them to her before speaking to Charles first. In the evening, Charles and Catherine are both giving each other the silent treatment. We also see someone outside with an axe, creeping around. Charles then heads out to find the town people who were to come over for dinner this evening, as they’re long overdue. 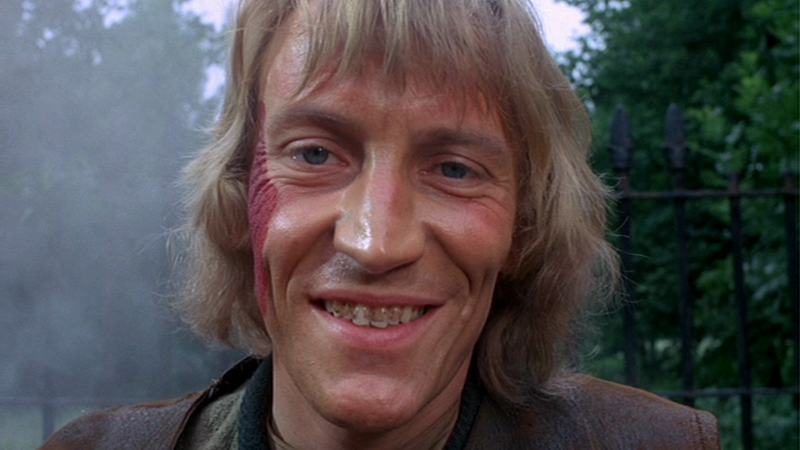 He finds an abandoned horse, and then one of his friends (the family lawyer) with a huge gash in his forehead. as he topples over, and dies. Back at the house, a window flies open and as Catherine attempts to close it, that ghastly figure with no eyes surprises her, and smashes the window. She quickly runs into the next room, and is frightened by one of the maids. She screams about the window, but when the maid checks it out, there’s nothing wrong. As Charles returns he grabs her hand, and she sees that his hand is bloody, and she faints. The following morning, the family doctor informs them that they are going to have a baby. They seem less than thrilled, and then Charles and the good doctor have a private conversation. The doctor (Patrick Magee), threatens to tell Catherine about the secret everyone is hiding. After a look from Charles, he then informs Charles that he wont tell. That same day, the authorities are at the woodsman’s cabin, questioning him about the murder. He denies he did it, and then Charles shows up out of the blue. He tells them he wouldn’t do this, because something he deserves is going down soon. Back at the house, Catherine is being tortured again, and one maid offers to show her what the secret is about the house. As the maid attempts to bring something to her, the pictures begin to rattle, and a spectral image of the severed hand reaches out, and chokes her. She then falls backwards down the stairs. She’s apparently dead. Catherine goes to check on her and confirms this. She also finds a book that she was bringing to her, so she scoops it up before anyone can see. When she’s alone, she begins to read about the family history. Charles confronts Silas, and tells him that if he leaves, he’ll be compensated nicely, but he refuses. Shortly thereafter, another doctor is brought in, by the name of Dr. Pope (Peter Cushing). He seems to be the only one except for Catherine that wants to find answers to this haunting, before it kills anyone else! The film is a decent one overall but definitely does have some slow spots. Most films do mind you, but these were a bit more noticeable. Cushing doesn’t show up until 2/3 of the way through the film, and there was even less screen time for Lom (he was quite a scoundrel). Both played good parts, but definitely deserved more screen time. The music score was definitely a low point for this one. The settings were a bright spot, as a few different locations were used. The special effects were just mediocre though, and that was something that should’ve been better for 1973. Yeah, the budget was low, it was Amicus after all, but there definitely should’ve been a better effort in that department. If you get the chance, sit down one evening and give it a watch. 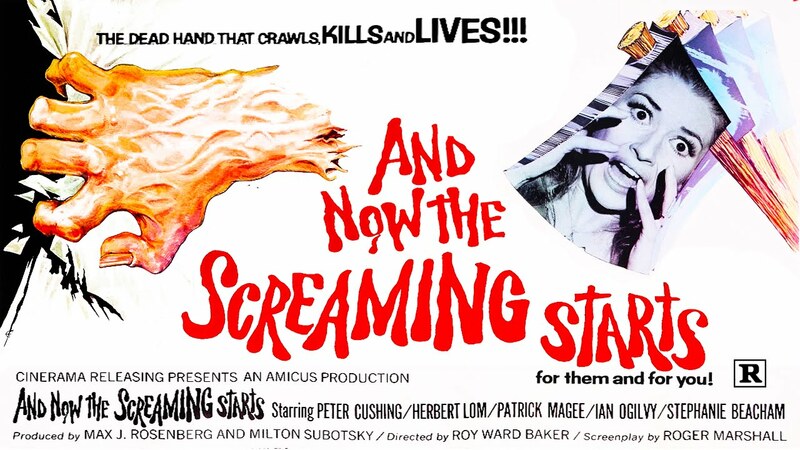 Cushing and Lom’s performances are strong enough to carry you through the other slow spots and mindless nonsense. I just viewed this film about a month ago, coincidentally. By 1973, this plot was quite shopworn and it does feel a bit like a Corman film from 7 or 8 years earlier, minus Vincent Price. Still, it’s enjoyable enough to watch through to the end, unlike some other late-in-the-cycle “scary old mansion” movies. For sure. 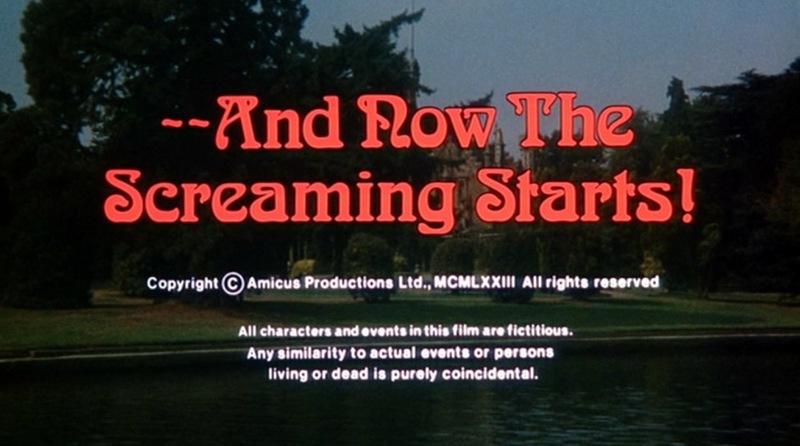 It seems like by the mid-1970s, Amicus and Hammer were running out of new ideas. Good run though!